The Roman Empire was more monetized than the Qin-Han Dynasty, but even the latter was more monetized than most ancient agrarian economies. The Romans minted coins of gold, silver, and bronze. The Chinese Empire issued only bronze coins; gold and later silver were used as ingots. 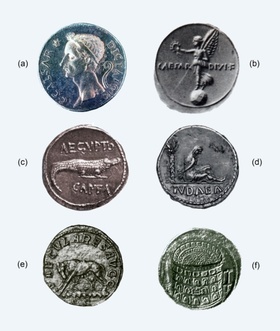 The Roman coinage doubled as a propaganda tool. Coins were frequently melted down and re-struck, bearing current messages. The most common designs were the image of the emperor or other grandees. (a) Image of Julius Caesar, with the inscription proclaiming his status as dictator. (b) Imperial image of Augustus standing on the globe. (c) Coin in the eastern provinces celebrating Augustus’ annexation of Cleopatra’s Egypt. (d) “Judea Morning”, issued 69-70CE upon suppression of a Jewish revolt. (e) Image of Rome’s founding myth: Romulus and Remus suckled by a wolf. (f) Coin commemorating the completion of the Colosseum. The Chinese warring states each cast their own bronze coins. They came in four basic types: Knife coins; spade coins with pointed or rounded shoulders; small shell-like coins; disc coins. The last type was used mainly in Qin. 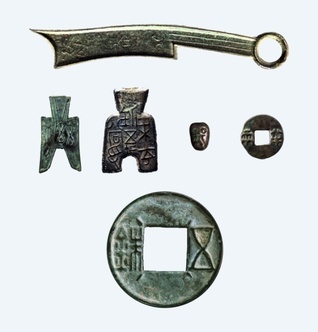 After Qin conquered the other states and united China, it standardized coinage. The Han Dynasty adopted Qin’s design, varying only the weight. The Han coin, shown disproportionately large, is a disc with a square hole, with a raised lip on the edge and inscription of the weight. The hole facilitates stringing these small-denomination coins into larger units. It became the basic design for two millennia in imperial China. The early Roman Republic and early Qin-Han Dynasty were economies of small free holders who tilled their own land. With the widening of the wealth inequality gap, many peasants lost their farm and became tenant farmers. Here are two rent-collecting scenes. Notice two differences. First, the Roman tenant paid his rent in money, the Chinese paid in kind. Second, the account records held by the two landlords show the different writing materials in the two realms. 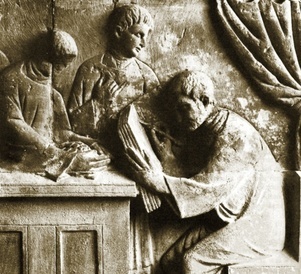 Tomb relief showing a tenant farmer bring in his rent, while the landlord checking his account book of wax tablets. Second or third century. (Landesmuseum, Trier). 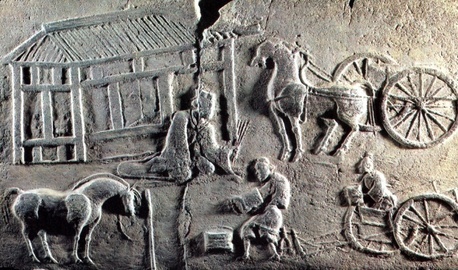 Tomb relief showing a landlord sitting in front of his house, holding bamboo strips of account record and watching tenants transferring grain from the cart to the receiving measure. Latter Han. (Guanghan County Cultural Institution, Sichuan). 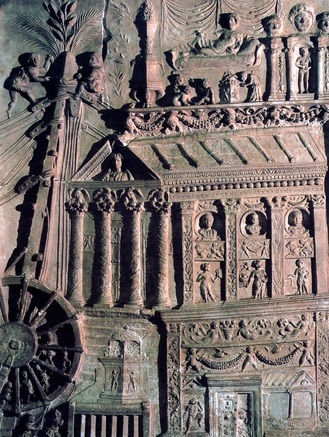 The Roman and Chinese were both agrarian economies, where more than eighty percent of the population engaged in farming and related activities. Grain was the largest staple. 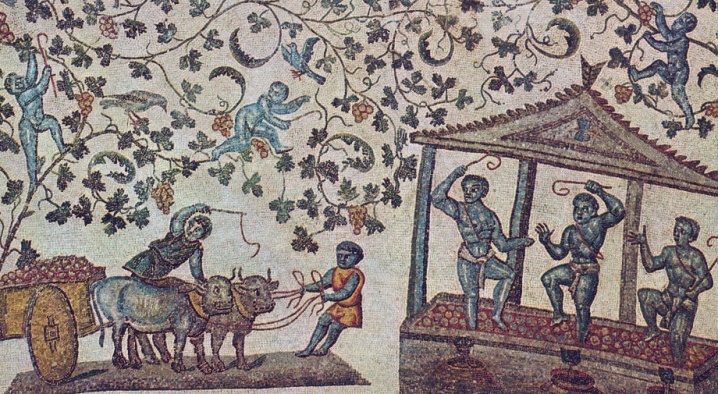 The Romans were also famous for the production of olive and wine, the Chinese for silk. 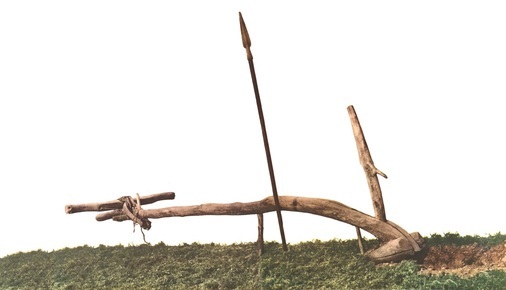 The plough and the lance are symbolic foundations of Roman civilization. Farmer-soldiers won an empire for themselves. (Museum of Roman Civilization, Rome). “Farming and military readiness” was the policy of Shang Yang (d. 338 BCE), whose reforms changed Qin from a backward country to the unifier of China. 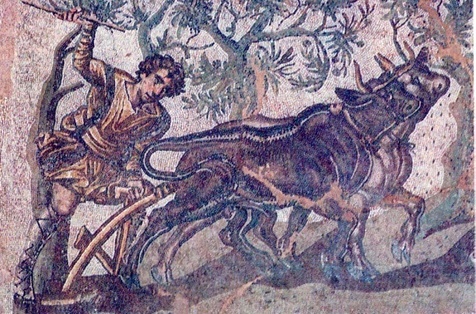 Third century mosaic showing plowing. (Cherchel Museum, Algeria). 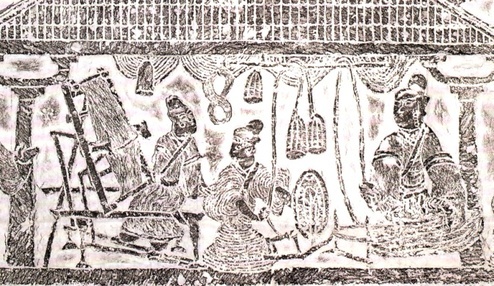 Rubbing of a tomb relief showing ox-drawn plowing, which was becoming widespread in the Former Han Dynasty. (Suining County, Jiansu). 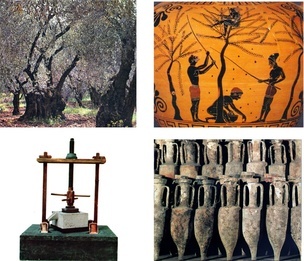 The olive grove was an important economic source for the Greco-Roman world. At harvest, the branches were beaten with long sticks. The fallen fruits were gathered and pressed to make olive oil. Oil was stored and transported in amphorae, some of which were recovered from sunken ships. Soil erosion was a big problem if plantations were not properly managed. 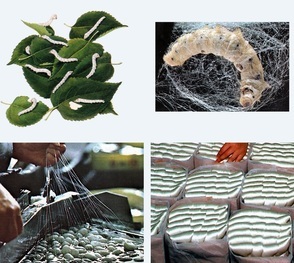 Silkworm, the caterpillar of the insect order Lepidoptera, is an eating machine of mulberry leaves. After four molts, it produces a lustrous protein mixture that hardens into a fiber, with which it makes a cocoon. Humans unravel the cocoon by soaking it into hot water. Bundles of raw silk once served as a kind of currency along the early Silk Route. Rubbing of tomb relief showing a woman twisting silk yarns (right), another interlacing the threads with a weft wheel (middle), and a third weaving with a loom. Latter Han. (Xuzhou, Jiangsu). Fishing with a net. 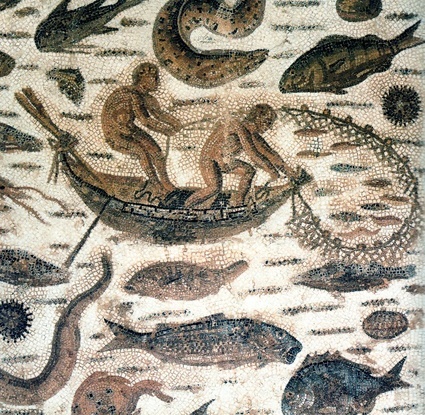 Detail of a second-century mosaic from Hadrumetum, Tunisia. 10. 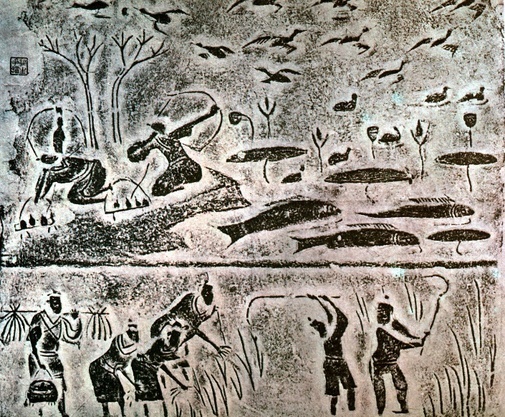 Chinese farmers, hunters, and fishermen. Fishing and hunting supplements farming for food. Latter Han tomb chamber decoration. (Chengdu). Market places were bustling in both realms. Commerce in the Qin-Han Dynasty was mainly confined to designated markets. Shops also lined streets in Roman cities. 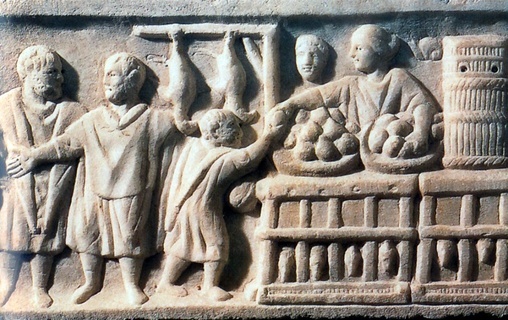 A market scene on a relief in Ostia, the port of Rome. Second century. (Roger-Viollet, Paris). 12. A Chinese wine shop. 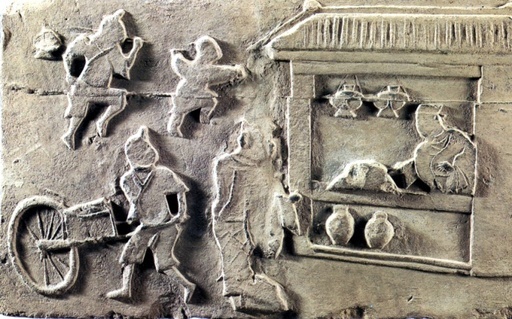 A wine shop on a tomb relief in Peng County, Sichuan. Latter Han. (Xindu County Cultural Bureau). A human treadmill (lower left) helps to raise material for building project. (Tomb relief, Haterii). 14. A Chinese salt mine. Salt mining was a big industry Sichuan. 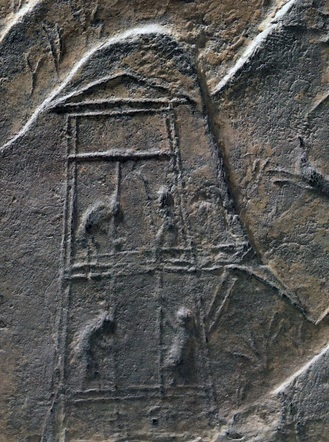 The Han brick picture shows a derrick over a brine well. (Chengdu Museum).